I finally was able to put my Sweet Pickles in jars. These pickles have several steps and it seems like I have the crock on the counter for ages. There is a story behind these pickles. We were invited to a friends house for dinner and to play cards. She served a sweet pickle that she had purchased in a local deli. I fell in love with them and told Jon that he could buy me those pickles at Valentines Day instead of candy, they were that good. I knew they had cloves in them so I hunted the Internet many times trying to find a sweet pickle recipe with cloves. I didn't have any success, but I kept looking. A neighbor stopped by one day and I mentioned this pickle to her and that I was searching for a recipe. She said "Joan, I have a recipe for sweet pickles with clove oil that I make all the time. I will bring you a jar so you can see if you like them". Like them!! I loved them, so I knew I had to make some. They are so very good and I ended up making two batches for us and 1 batch for Mom with a total of 36 jars of pickles. If anyone would like the recipe, please e-mail me or leave a comment. 1. Place cucumbers in a stone jar, glass or enameled container. Combine salt and 1 gallon water. Bring to boil and pour over cucumbers. 2. Cover with a plate and weight down. Brine must cover pickles. Keep stiring water every day to prevent mold. If mod exists at the end of 8 days, rinse well. It will not hurt the pickles. 3. Let pickles set until the 8th day and on the 8th rinse well and cut in to either slices or chunks. I chunk mine. Return to container. 4. Mix up 1 gallon water and 1 T powdered alum and bring to boil. Pour over pickles. Repeat this every day until 11 days has passed, including the first days that the pickles are in salt water. 5. On the 12th day, combine sugar, vinegar and celery seed and bring to a boil. At this time I add a few drops of green food coloring to give the pickles a nice fresh look. Repeat this for 2 more days. 6. On the 14th day pack cucumbers in hot glass jars. Bring syrup to boil and pour over cucumbers that are in the jars. Process in boiling water bath (212) for 5 minutes. Remove jars from canner and listen for a pop to make sure they are sealed. Yum! Joan these look fabulous!!! But I really like the little cucumber from Stampin' Up! Cool as a Cucumber, personally! MMM - your pickles look yummy. Goodness! Everyone will love your special Christmas gift! Mmmmm! Those look really good! 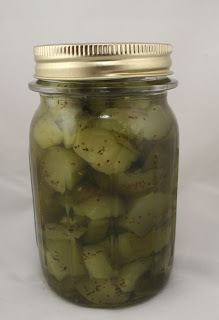 I am emailing for the recipe :D.
I'd love to try your recipe for sweet cloved pickles. I can swap you for a sweet relish that uses zucchini and red peppers...makes a nice Christmas gift also. Joan Ellen Hutson sells a Lockhart stamp that is a jar of pickles with a label. Might be great for your project. Gosh, these sound interesting!!! But I don't make pickles, I just love to eat them!!! So the next time I see you IRL a JAR of pickles would be appreciated -- LOL -- just kidding!!! Too bad I didn't live closer!!! I can't think of any pickle stamps, but since you're thinking Christmas, are you familiar with the German tradition of hiding a pickle on your Christmas tree? My great aunt always has a FABULOUS tree and over the years has aquired three different pickle ornaments. When anyone visits, the first to find all three pickles gets to choose two ornaments as gifts. My husband found a pickle ornament our first Christmas that he bought for me, so we have started that one too. A stamped pickle image would be a great way to give ornaments away for the holidays! :) Thanks for getting me thinking!